As a Certified Personal Trainer and Running Coach, I’ve spent years discounting CrossFit training as a viable workout for my clients. In fact, it wasn’t until Nick Grasso joined our team that I took a second look at this intense workout program and thought, "Have I had blinders on this whole time?" Through observing Nick's training style, seeing the commitment he gives to this competitive fitness program, and educating myself on the benefits, is it possible that I’m becoming a CrossFit believer? If you’re curious about exploring this style of training, get ready to take a serious dive into some of the pros and cons of CrossFit training. I'd also love to hear your personal opinion - feel free to contact me at karen@runfitmke.com to share your thoughts. CrossFit is everything from running to swimming to weight lifting to obstacle courses – it’s pretty massive stuff! – and it combines a variety of exercises into daily workouts with the aim to "test a different part of your functional strength or conditioning...building a body that’s capable of practically anything (Nerd Fitness, A Beginner's Guide to CrossFit)." It's also data driven, which means there is a repetitive, measurable approach to this training style. While I’ve always respected those working hard to improve their entire bodies, it didn't really feel as if this style of training was beneficial for a long-distance runner like me. Don't I need a training that is more "sport" specific to help me cross the finish line? CrossFit is for CrossFit Gyms. Spinning is for Spinning Gyms. Running is for Running Gyms. Right? More importantly, I'd heard of numerous injuries from this style of training, and that's no good. Looking at all of these cons, I wasn’t interested in learning the ropes. And, I definitely wasn't interested in providing this type of workout to my clients. My impression of CrossFit started to change after I watched Nick workout and train clients. As a Marine, CrossFit was part of Nick's physical training, aiming to increase mobility, strength, and overall functional fitness. Or, as Nick likes to put it, "we weren't training to be the best at one thing - we were training to be great at many things, like being a jack of all trades." Too many clients told me they had been injured from CrossFit, and as a Personal Trainer, safety is of the essence! Even my own Physical Therapist said that CrossFit was the number one cause of injury in his clientele, so why would I even consider it? Nick had a different perspective. He was trained well. He doesn't just go for someone's "big goal." In fact, he is an absolute perfectionist when it comes to form and safety, making sure a person’s body is prepped and ready before adding weight or increasing intensity. He's right. Injury can happen in any sport. I also started to realize that CrossFit is not necessarily about the number of lbs. one is lifting - it's truly about form and function. If done right, CrossFit can actually help prevent injury and make the things you need to do in your everyday life easier. And, if training with a clean diet, CrossFit has been proven to help people fight chronic diseases, like diabetes, and I'm all for that! Commitment is so important to CrossFit athletes and everyday is a work in progress! CrossFitters are constantly testing their abilities, seeking patience when they fail, and coming back for more to achieve the unthinkable. And, I totally get this! As a runner, if you're going after personal records for a marathon you have to train like no other. You have to invest your energy and mental stamina everyday if you want to succeed. There is an intensity runners need to satisfy, and this is where I could totally start relating to CrossFit. When I see Nick working out, it amazes me. I have ultimate respect for his devotion and can actually see his abilities improving every time he sets foot in the RunFit gym. It also gets me excited to think that I could learn how to throw myself into a handstand and bring a different form of "play" and intensity into my workout. If you want a real understanding of the elite Cross Fitters, check out “The Fittest Man on Earth” on Netflix. You’ll have a whole new appreciation for what these people do. Is this Personal Trainer a Believer? Yes. I'll admit that I had blinders on. I had designed a gym around helping people become better runners or for anyone who wants to get their body running fit. It was designed around my passion, and I believed one should never stray from that. But, when you learn other kinds of movement, just because it's different, it doesn't mean it can't be equally effective or useful to your existing passion. With that, at the age of 40, I'm ready for new challenges. This newly found knowledge will also benefit my coaching style as a Personal Trainer, our clients, and my running (training for a Marathon? Click HERE for my training tips!). 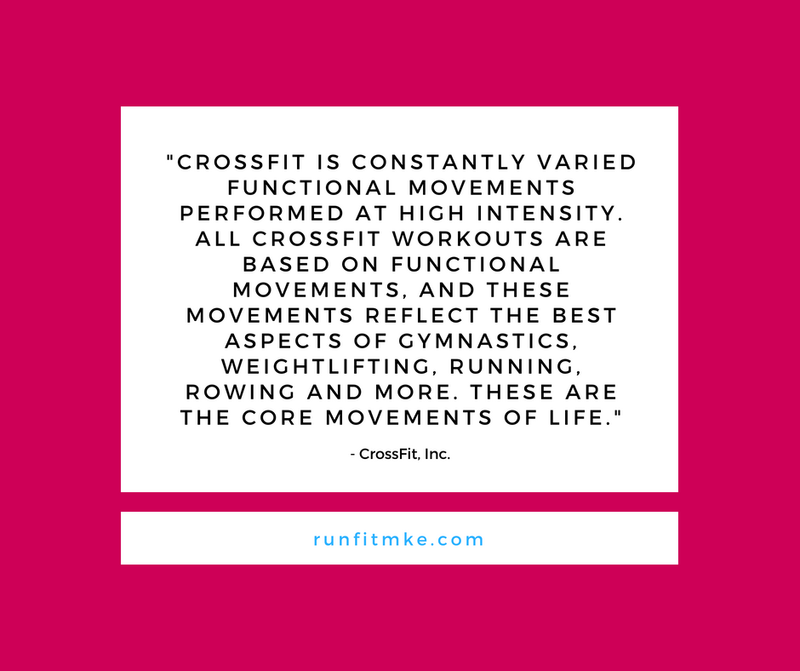 While we'd need to become certified to lead CrossFit at RunFit MKE, I now see how this style of training can work for any client that comes in. Nick is also ready to explore new ways of working out. By introducing him to running, we both know he'll become a better Personal Trainer, too. "Coach Karen continues to introduce me to new movements that I simply didn’t know existed, especially when I'm training runners. This has helped me tremendously as a Personal Trainer and broadened the clientele I am able to service. Her knowledge and training style is also helping me with my own fitness goals." *Note: Here at RunFit MKE, we can’t claim ourselves to be CrossFit Instructors or Trainers, unless we become certified. Nick Grasso has trained and competed in competitions. If you're looking for Personal Trainer that help you explore new challenges, try us out. The team at RunFit MKE truly cares about helping our clients live their best lives by providing a safe, yet empowering workout. We also get to know our clients on a personal level, which is why we've had great success helping them meet their fitness and nutrition goals. Click on the link below and let's get you started!